New units and new abilities for all factions, new structures, new tech tree, new support powers, new super-weapons, new multi-player colors, new sounds, new crates. It was just called "Desolater" back in RA2, so it makes sense to gives homage to a better-made game. EA has been rather obnoxious with their new hopes for Red Alert 3 uprising. I'm actually hoping someone will make some models for old units that can be put into RA3. Better-made game? I don't think I would play these over-texturised Star Wars games made by Petroglyph. Fortunately, the Westwood has gone before they made more hasty'n'pixel games. @vikestart: The units will be somewhat different for the ones in Uprising and most of them will have different abilities. That's why the different names. @Dr.Salt: I might add some old style models into the mod. it won't work on the yuriko campaign, if you are gonna include it to this, but well, for the other's? 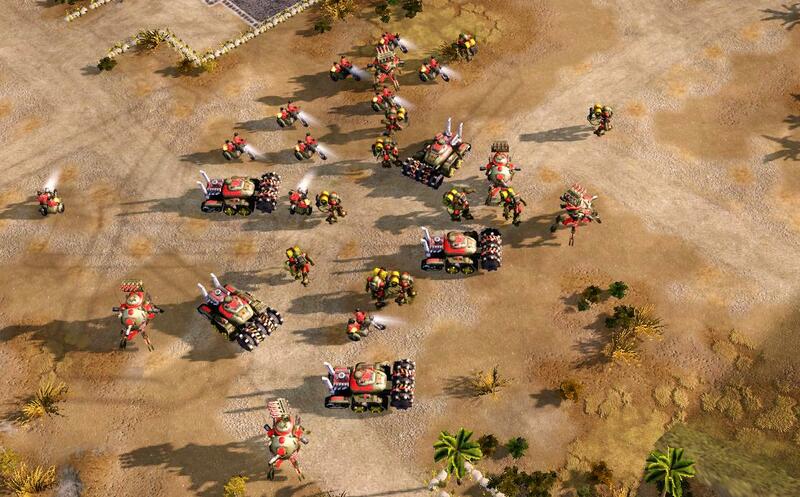 Dude...This is a screenshot from Uprising, not RA3...So this means you have yet to implement most of these units. DOES THE JAPANS GET THE UPRISING UNITS AS WELL? Part of the Soviet Units that will be added in the mod: the Desolater, the Shredder Tank, the Rocket Drone. The Tesla Tank will also be added (not in the current picture).